It's over. Comcast formally withdrew from its pending $45 billion merger with Time Warner Cable on Friday morning -- after the companies failed to convince regulators the deal would be good for consumers. "Today, we move on," Comcast CEO Brian Roberts said in a statement. "Of course, we would have liked to bring our great products to new cities, but we structured this deal so that if the government didn't agree, we could walk away." Roberts said in an interview on CNBC that "we tried our best to make the case." But the government was prepared to block the deal, something Federal Communications Commission chairman Tom Wheeler confirmed in a statement shortly after Roberts spoke. Wheeler said the decision to pull out of the merger plan "is in the best interests of consumers." "Today, an online video market is emerging that offers new business models and greater consumer choice," he added. "The proposed merger would have posed an unacceptable risk to competition and innovation, including to the ability of online video providers to reach and serve consumers." The FCC's partner in the review, the Department of Justice, had also concluded that there was no cure to the anti-competitive risks presented by the merger, according to a department official. Earlier this month attorney general Eric Holder gave the go-ahead for a lawsuit to block it. On Friday Holder called "the companies' decision to abandon this deal is the best outcome for American consumers." The feeling of inevitability that surrounded the merger when it was proposed in February 2014 was repeatedly punctured in recent months. The merger's rejection has been expected for the past couple of days; Comcast stock was basically unchanged on Friday morning and Time Warner Cable stock was up about 2%. Comcast's board met to sever the merger plan Thursday night and Time Warner Cable's board met to do the same thing on Friday morning. "Over the last 48 hours, it became absolutely clear that the deal was not going to be approved by regulators," Time Warner Cable CEO Rob Marcus said in an interview with CNNMoney. His tone was upbeat, saying the cable company is getting "back to business as usual." But there's no doubt that the scrapping of the merger is a severe blow to the executives who have spent the last year lobbying for it. Roberts and his executive vice president David Cohen, who personally oversaw the process, had exuded confidence in the merger -- confidence that, in hindsight, may seem like arrogance. To consumers and regulators, there was always ample reason to be skeptical of the deal, because it would have mashed up two companies many customers love to hate. But to Comcast (CMCSA), the combination was eminently logical and, in some ways, necessary. It would have given Comcast millions of subscribers in cities like New York and Los Angeles. With those subscribers would have come more influence over the future of the television and broadband markets. The death of the deal leaves a series of questions about what happens next. -- Will another company buy Time Warner Cable? Charter Communications (CHTR), which previously pursued the company, is said to be interested once again. A merger would make Charter the No. 2 cable operator in the country behind Comcast. Conversely, will Time Warner Cable (TWC) try to acquire some smaller cable operator? On Friday morning, Marcus's statement called his company "a one-of-a-kind asset" and added, "We are strong and getting stronger." In an interview, he declined to comment on whether there are active talks with Charter. "I never comment on conversations we're having with others unless somebody else decides to make it public," he said. -- Will service get better or worse? Comcast had pledged to upgrade Time Warner Cable's systems, promising better service in cities like New York and Los Angeles. Will any of the new scenarios for Time Warner Cable result in better television options for customers? -- What's next for Comcast? 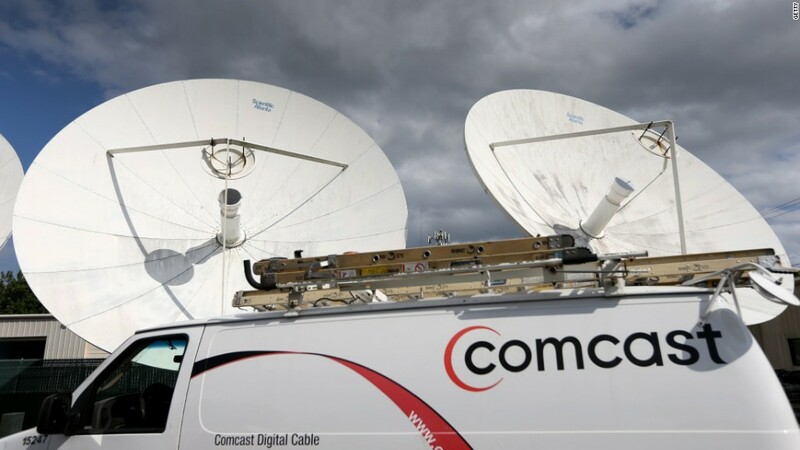 Forrester analyst James McQuivey said in a note on Friday that Comcast may now sell a cablelike service via the Internet to customers all across the country, rather than just offering TV to people through its own pipes. "Remember that when the deal was announced, HBO still wasn't going direct, Sling TV didn't exist, and Verizon hadn't announced a national, over-the-top pay TV offering," he wrote. "Times have changed and in many regards, that's the competitive field that Comcast needs to set its sights on, not the mucky and overregulated business of putting cables in the ground and obsolete set-top boxes in people's homes." -- Will the other pending merger, AT&T and DirecTV, run into trouble? The conventional wisdom right now is that Washington regulators are looking more favorably at that deal than at the Comcast proposal, partly because it doesn't involve as many broadband customers. Meanwhile, opponents of the deal, like the public interest group Free Press, are in a celebratory mode. Free Press CEO Craig Aaron credited the government regulators "who have listened to the public and are seriously working to increase competition and lower the costs of access." Comcast's competitors are privately celebrating, too. Companies like 21st Century Fox and Time Warner, the owner of this web site, had concerns about the merger all along, but rarely said so publicly. Dish Network, the country's No. 2 satellite operator, did speak out -- and on Friday it called the death of the merger "the best possible outcome for consumers, who deserve innovative, thriving video and broadband marketplaces." Evan Perez contributed reporting from Washington.